Plug ‘n pay billet distributors are designed for maximum ignition performance and easy installation all at a price that you can afford. Replace your outdated points or electronic distributor with this performance proven distributor and which features the patented Ignitor® II electronics and a CNC machined 6061 T-6 polished billet housing. Features: Integrated patented Ignitor II technology with adaptive dwell control. Cobalt magnets and Hall Effect trigger for stable timing and precise spark distribution. A powerful micro controller with adaptive dwell algorithms constantly adjust the dwell angle to maintain peak energy throughout the entire RPM range for increased high and low RPM performance. 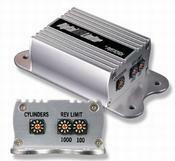 Ignitor II compensates for inherent electronic delay by adjusting the spark timing throughout the entire RPM range. Synchronized peak current and spark timing reduces heat build-up. Precision CNC machined billet housings are polished to a high luster. Tempered distributor shafts have low torsion displacement for accurate timing and longer life. Upper ball bearing and extra long oil impregnated bronze lower bushing work together to reduce friction and high RPM vibration. undetectable presence under your distributor cap. Features: Delivers twice the voltage to the spark plugs, increasing horsepower, fuel economy, and spark plug life. 2:1 improvement over “points” in current fall time for increased coil output. Rotating cobalt magnets trigger a Hall Effect integrated circuit. ...no points to burn, ...no moving parts to wear out. Epoxy moulding makes our module impervious to dirt, oil, grease and moisture. Fits entirely inside the distributor. No "black box” to clutter the engine compartment. Stable timing ...no need for any adjustments. Will trigger most multi-spark CD ignitions. Use with Flame-Thrower® 40,000 volt coil for optimal performance. Available for 6 and 12-volt negative and positive ground systems. While it’s the perfect coil to go with the PerTronix Ignitor breakerless ignition, our 40,000 volt Flame-Thrower canister coil can benefit virtually any distributor type inductive system. Its higher voltage allows larger spark plug gaps for added power, smoother response and better fuel economy. 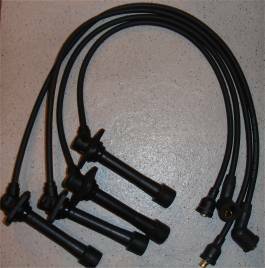 These coils are internally resisted so they are compatible with many ignition systems. Our oil filled coils offer great heat control for street driven vehicles, while our epoxy filled coils provide superior winding support for high vibration environments in offroad vehicles and boats. Features: 40,000 volts. Available chrome plated or black for that “stock look”. For use with inductive ignition systems. 1.5 or 3.0 Ohm primary resistance values available. Flame-Thrower coil, increase spark plug voltage by more than 40%. Features: Thick film technology on alumina ceramic substrates removes heat for greater accuracy and improved reliability. Laser trimming gives precise peak current control for increased energy output. Each module is tested twice with automated equipment to insure trouble free operation. misfires resulting in more peak horsepower and torque. 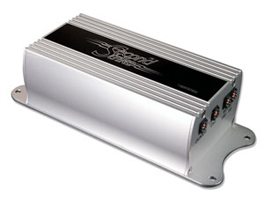 Features: Only system to provide a second spark throughout the RPM range. Powerful CD second spark resulting in more complete combustion. Increased burn time makes more horsepower and torque at high RPMs. Unique (CAO) feature adjusts the timing of the second spark. Built-in digital rev limiter with high resolution. Digital rotary switches permit easy adjustment. Adaptive voltage feature prevents overdriving the ignition coil. Voltage protection prevents damage from reversed polarity. Tachometer output with TTL interface and near 50% duty cycle make our limiters compatible with most modern tachometers. sequential spark stealing method provide superior control of rev limits and a rapid response time to over rev limit events, preventing engine failure. Once the established RPM limit is reached, random spark stealing starts within one spark, reducing plug fouling common with repetitive stealing type limiters. 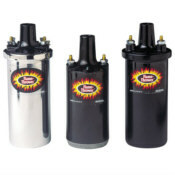 Rev limiters come with multiple analogue filters and one digital filter to prevent coil noise interference from affecting the established rev limit. Installation is a snap with a four wire hook-up and easy to understand instructions. The rev limiter’s small size permits installation in even the most crowded engine compartment. Features: Digital microcontroller based unit provides greater accuracy (+/-0.01%) over analogue systems. Easy to use rotary switches permit settings with a resolution of 100 RPMs. Combined random and sequential spark stealing method. Tachometer output with TTL interface and near 50% duty cycle make our limiters compatible with most modern tachometers. Reverse voltage protection. Easy four wire hook-up. Compact size: 3”L X 2.5”W X 1.4”H Light weight: 0.75 LBS. performance. Flame-Thrower 8mm MAGx2 wires deliver in more ways than one with dual current paths for reliability and redundancy. Low 500 ohm/foot rating gets more energy to the spark plug. Select a custom tailored set for out of the box fit or a universal kit to match your unique engine and wire loom configuration. All 8mm MAGx2 wires feature white “Flame-Thrower” script. Features: Two current paths for reliability and redundancy. Primary path: Spiral wound stainless steel alloy. Secondary path: Carbon impregnated fiberglass centre core.